A 15 v% SiC particle reinforced Al-2618 matrix composite was selected to study strengthening mechanisms under different heat treatments to produce specimens in hard or soft matrices. 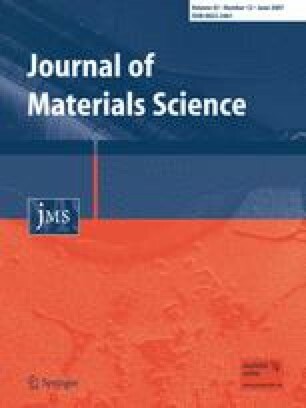 The investigation showed that the conventional micro-mechanism models play a minor role in strengthening the composite by further addition of the SiC particles. A load sharing mechanism of the particulate reinforcements is suggested to explain the experimental yield strength increase. An analytical model based on Eshelby equivalent inclusion approach and Mori–Tanaka mean field extension was established by introducing numerical matrix and composite secant moduli to simulate the stress–strain curve of the composite. The same modeling work was also carried out by FEM analysis based on the unit cell model using a commercial ANSYS code. The modeling results by both models on evolution of the load carried by the SiC particles during straining provide strong evidences to back up the strengthening mechanism of the load sharing. However, the modeling work exposes that the load transfer mechanism plays a dominant role only for the composite with hard matrix and the reason for load transfer is mainly the mismatch strain between particulate reinforcement and matrix rather than commonly believed friction at their interfaces. Nevertheless, an experiment was used to estimate average stress level in the SiC particles by observation of the numbers of broken particles in the composite with different strains, which also offers a good support to the modeling work. The authors would like to acknowledge Natural Science Foundation of China for the financial support by the grant 50471024 and 50171018, and Education Ministry of China for an outstanding teacher research fund to this study. We would like to thank Dr B. Derby, UMIST, for his courage to initiate this study. Some student work from Minzhao TAN, Huiqing Liu and Yajuan Zhao are also acknowledged under their agreement.